We Offer The Lowest Rates Along With The Best Country Comfort! Stop in and make yourself at home. Hello, My Name is Lonnie Gay. My family and I invite you to stop in for a visit to Country Oaks Campground and RV Park. Our campground is a full-featured site that is just minutes away from the Georgia coastal waters. You will find the atmosphere friendly and relaxing. 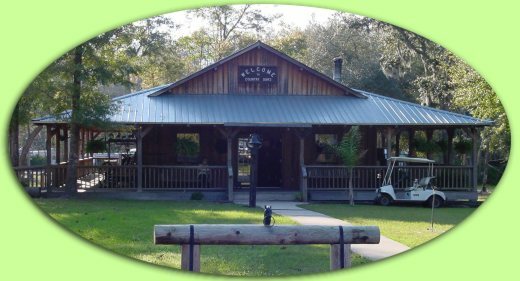 All forty four RV sites are full hook-ups and the campground is surrounded by lush oak and palmetto forest, teeming with wildlife. Campground guests aren't the only anglers to enjoy our fully stocked fishin' hole, an Osprey or two and Great blue heron are regular diners too. My family & I built this park in 1997 from a section of our 18 acre property. When you stay here, you are truly our guest. The convenience of Jacksonville is just a few miles down the road. We're just off of Interstate-95 at Georgia exit #1 (See Map). We're the last exit before Florida where you'll find 2 full-service truck stops. Gas prices here are well below the national average. That's just one of the many reasons our campground is a great stop-over if you're just passin' through, to or from the Sunshine State. Once you're here though, you might find that you want to stay a spell longer. Many of our guests are repeat visitors and enjoy coming back home to Country Oaks. Please have a look around our web site. We have the lowest rates in the area and very reasonable weekly and monthly rates too. If you'd like to stay with us please call for reservations at (912) 729-6212. If your on the road traveling, our GPS Address is: 2456 Scrubby Bluff Road, Kingsland, GA 31548. Once again, Welcome and Thanks for stoppin' by!